This is one of a set of three photographs showing the same spheres with different lighting conditions. 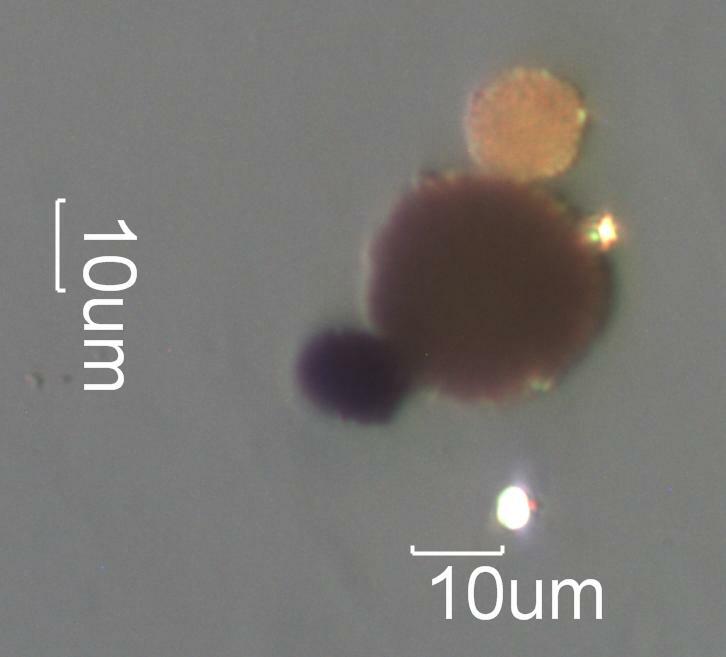 This shows the transmittance of these three paint spheres. One paint sphere is quite opaque. The other two allow some light to pass through with the smaller sphere transmitting more light. Limestone (calcite) bulking agent particles can be seen slightly protruding from the larger two spheres. The greyer appearance of the largest sphere is due to less light scattering through the particle because of its greater thickness. This is from an environmental tapelift collected in a home. Paint spheres are created by both spray painting and by brushes or roller used to paint. Spray painting tends to create more paint spheres per volume of paint used in the environment than brushing or rolling paint but these other methods of applying paint still produce paint spheres. Paint typically consists of an organic vehicle, an opacifier, pigments, bulking agents, and curing agents. The vehicle is the material that forms the film in which the other components are suspended. It is present in solution or as a monomer in the "wet", pre-cured paint. The opacifier is a material with a refractive index very different, usually higher, than the cured vehicle. The difference in refractive index results in light scatter which prevents anything under the applied paint from showing through the final paint film. Titanium dioxide is a common opacifier in most paints though calcium carbonate and other minerals have been used. The pigment provides the color or shade desired for the paint. In some instances the opacifier may also be the pigment. There are often more than one pigment present in the paint. The bulking agent is a less expensive filler that provides volume or bulk to the paint. Clay is a common bulking agent but there are many other materials that can be used as bulking agents. Curing agents are chemical compounds added to the paint to assist in the proper curing of the paint. They facilitate the formation of a film with the desired properties but are not generally chemically bound to that film. The curing agents can be leached from the film under some circumstances without damaging the film itself. The presence of paint spheres indicates that painting has taken place at this locality or nearby. Paint spheres persist in the environment and are an indication of how thorough a cleaning has taken place since the painting event and how extensively contaminants were dispersed in the environment during the activities associated with the painting event. The presence of paint spheres may indicate a source for solvent odors. On close examination a thin film of the vehicle may be visible at the edges of the sphere. The opacifier and the pigment may be visible as particles often around a micrometer in diameter. Titanium dioxide is often present in the sub-micrometer range but its birefringence is so high that it will be visible with crossed polarized light even at that size. Bulking agents, such as quartz or calcite, is often larger and may be visible protruding slightly from the bulk of the sphere. Paint spheres are often found with other construction debris such as sawdust, plaster, magnetite spheres, glass fiber, etc. In an automotive body shop or vehicle maintainece facility they are often associated with paint flakes, magnetite spheres, abrasives, tire wear, metal particles, rust, plastics, glass fiber, cotton rag fiber, and clear, colorless spheres of "clearcoat". If this is from a paint spray booth then spherical agglomerates of alkaline salts, organic residues, and pigment may also be present. If it is from a local uncontrolled painting activity then the spheres will not be associated with construction, body shop, or water scrubber residues. Crown, David A., THE FORENSIC EXAMINATION OF PAINTS AND PIGMENTS, Charles C. Thomas Publisher, 1968.